As tomorrow and my first dress fitting beckons (!) I thought it was high time I shared some wedding dress fitting survival tips. Some are gleaned from the team here at Quintessentially Weddings, and some unadulterated insider knowledge by way of model castings and a Saturday job in a bridal shop as a teen. Some are just a little unashamedly self-indulgent as I see the fitting as an extra special excuse for some new Agent Provocateurs. Hello, bride! 1. Take the maids or friends who were unable to come on the dress hunt, and also those who will be honest with you about your planned 2 stone weight loss. You know who they are, and they love you just as you are (as does your future husband, who asked you, not you-three-sizes-smaller, to be his wife). 2. Go prepared with shoes: these should be either your actual wedding shoes or shoes of a similar height to those you anticipate wearing on the big day (and if you are doing your 'something old' with the shoes, give the soles a thorough clean to avoid messing the dress and annoying the shop assistants). 3. Plan an appointment as early in the day as possible. The dieter's logic is that you are generally 1 -2lbs lighter in the morning and you will likely be a bundle of nerves on the big day itself so will lose this amount naturally with the jitters. 4. Most bridal specialists will not order a dress for you based upon a hoped-for slimming down. They aren't being mean - quite the opposite in fact when it comes to your confidence and purse. Most brides do not lose that much weight, and there is only so much even a super skilled seamstress can do with a seam allowance. 5. You are better off going armed with some Spanx and trying to not drink too much (a beauty pageant trick I am almost ashamed to know of) during the day so as to lessen water retention and make your body appear more toned. Avoid carbs, salt, sugar and fizzy drinks for a few days prior to the fitting as these will be easy to repeat before your wedding day and give a realistic 'trimming' of your figure without full throttle, silly dieting. 6. My relationship with Agent Provocateur is almost as strong as I hope my marriage will be. Pretty, sophisticated and pleasingly saucy without the all-out kink of its mainline collections. The bridal ranges and Imelda strapless bra make for good choices if your dress is strapless or has a flimsy top (see right). And I promise there will be no yanking up of your dress every few nanoseconds. 7. If there is lacing, don't be afraid to ask for a good hauling-in. 8. Move around in your dress and don't be afraid to ask for a little more fabric in places where you feel restricted if your gown is made to measure or can have such alterations (Ian Stuart is fantastic at letting brides play with their dresses). You need to be able to sit, dance and walk with ease. 9. A tip learnt from the lovely Miss Bush Bridal Wear: don't be cheeky and expect any alterations for free. The seamstresses bridal shops will use will be exquisitely skilled. Their time is worth every penny. Equally, don't scrimp on alterations - a gaping or ill-fitting gown will make you feel uncomfortable and not look your best in pictures. 10. 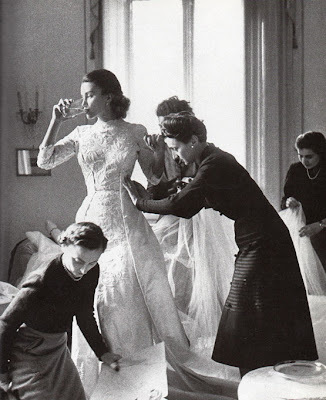 Enjoy seeing your dress again - it isn't likely you will have any wobbles, but some bridal shops will (with a bit of gentle persuasion) allow you to switch to another gown. However, check you can afford any difference in cost and no formal order has been placed. This is the 'forever hold your peace' part when it comes to your gown.